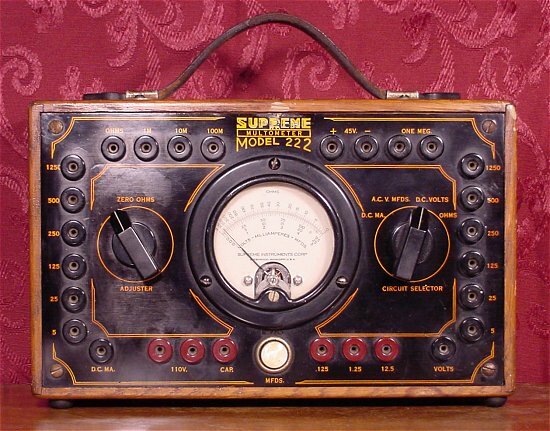 In the 1920s radios were battery powered. 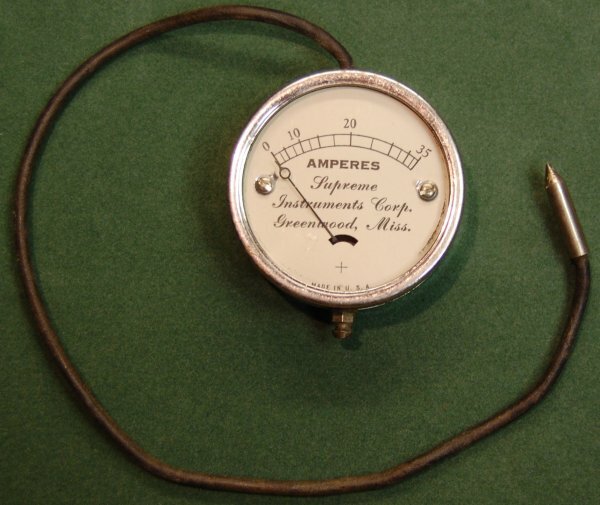 This early Supreme pocket watch style meter was designed to test radio batteries. No selector for ranges. Each range has it's own pin sockets for test leads. 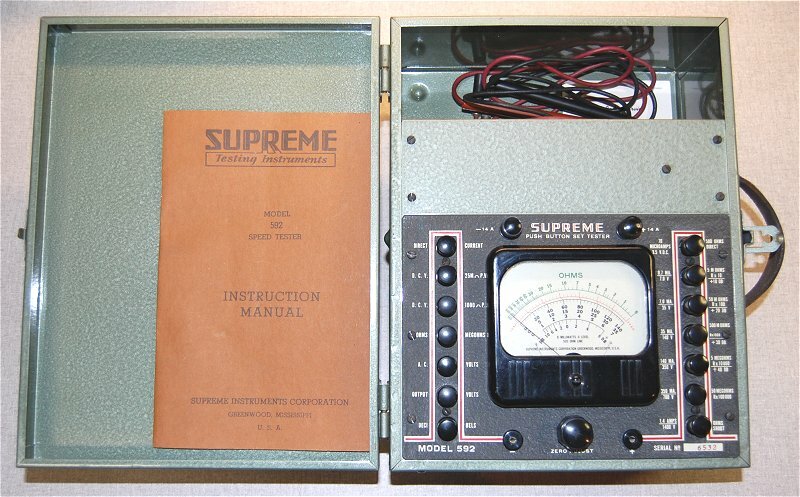 Meter is 10" X 6 ¼"
Meter is 10" X 6 ½"
This Supreme model 404 "Minimeter" is only 2¼" x 3¼" x 1½". 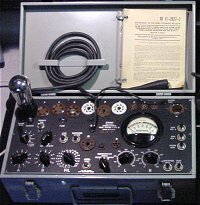 Each range has it's own pin sockets for test leads. 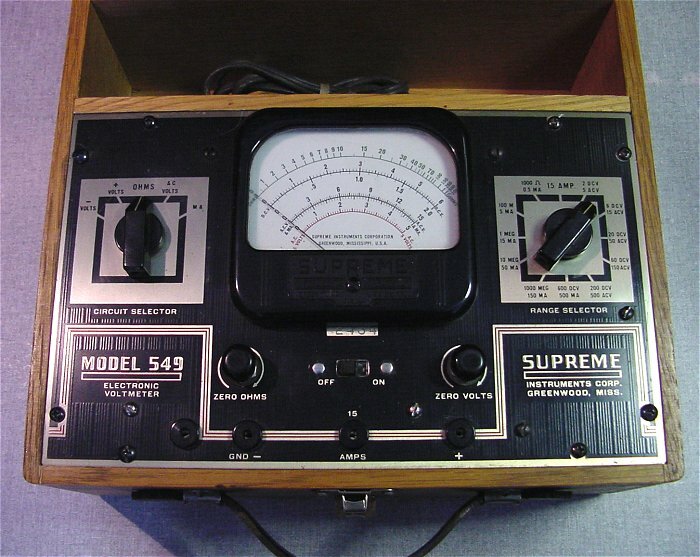 The Model 537 measures DC volts and ohms. 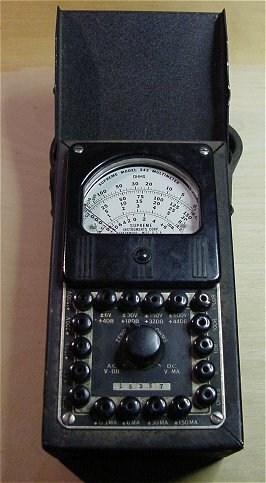 The 537 has a bakelite face mounted in a metal case that measures 5¾x3½"x3¼. 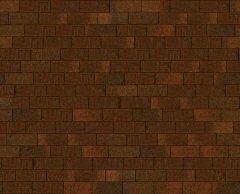 No selector for ranges. Each range has it's own pin socket. 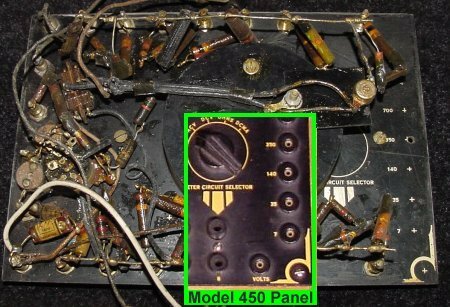 AC Volts/DB with 6V,30V,150V, & 600V ranges. 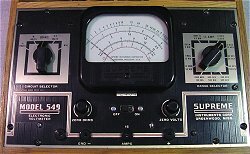 DC Volts with 6V,150V,300V, & 1,500V ranges. 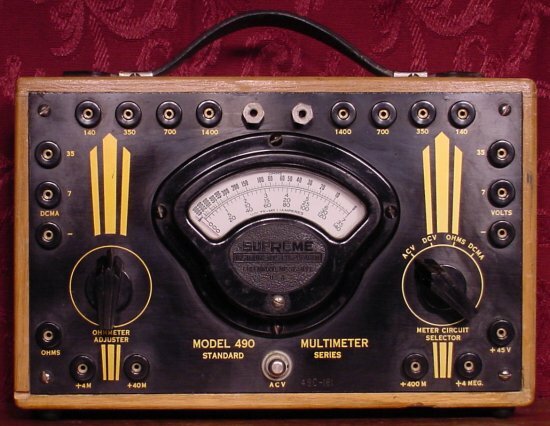 Milliamps with .3 ma, 6 ma, 30 ma, & 150 ma ranges. 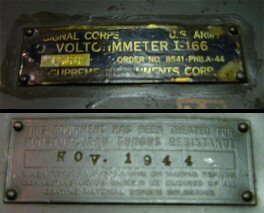 I also have a 542 that was manufactured for the Military and a Telephone repair version in a metal case with a flip down cover to protect the meter face (right photo). 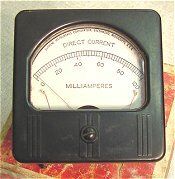 AC Volts 15V,150V, 600V, 3000V ranges. 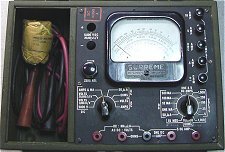 DC Volts with 15V,150V, 600V, 3000V ranges. 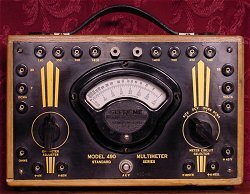 Milliamps with 6 ma, 60 ma, & 600 ma ranges. 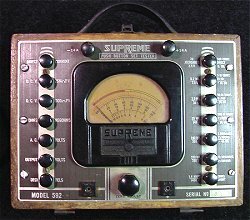 The leather case has room for test leads in bottom. 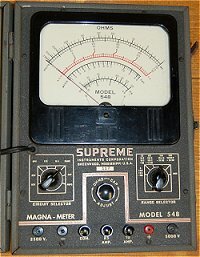 The Supreme 547 multimeter used pushbuttons to select all functions and ranges. 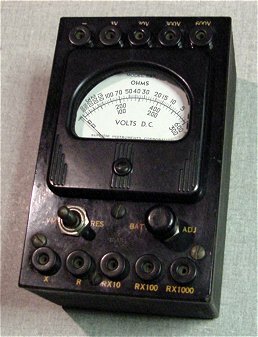 AC Volts, DC Volts, Ohms, Amps and measures Capicators. Oak Case with leather handle. AC powered. Steel Case with leather handle. 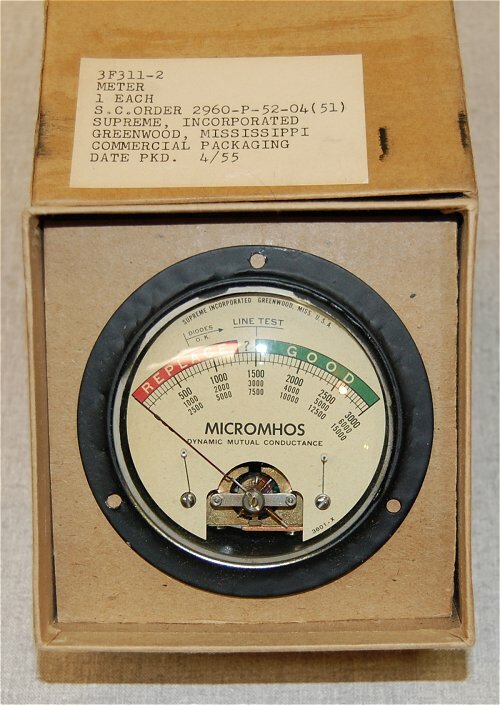 This vacuum tube voltmeter uses a #6F8 and a #37 tube. 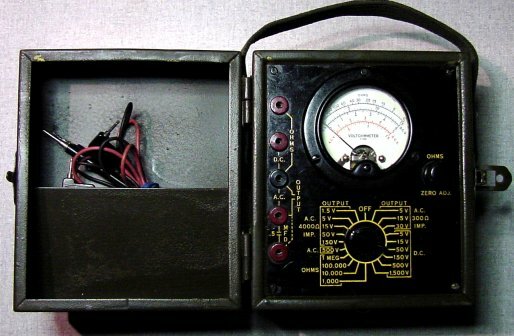 Closed, the oak dovetailed case is 11"x9¾"x5½"
This vacuum tube voltmeter uses a #6SN7 and a #6X5 tube in the meter and a #9006 tube in the probe. 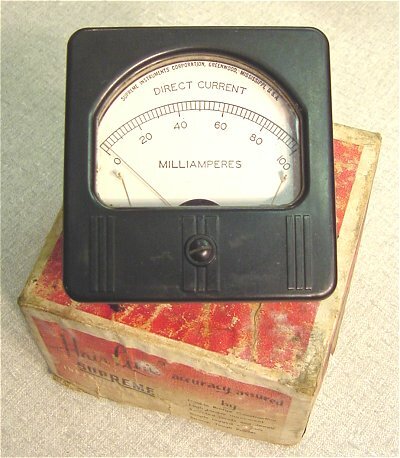 The 565 voltmeter is enclosed in a steel case. Each function and range is selected by radio style pushbuttons. 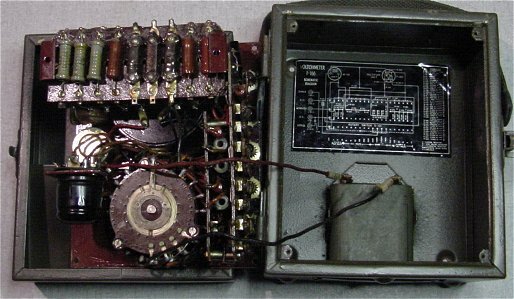 The early production of the 592 was also offered in a larger wooden case with storage compartments seen at right. 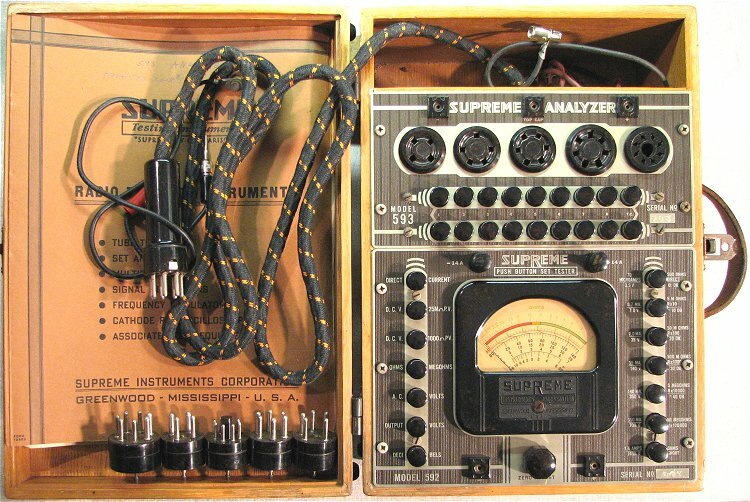 Later production models were offered in a steel case with storage. 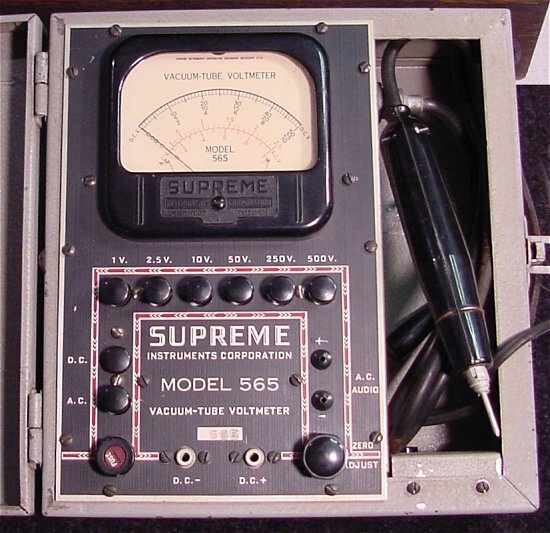 The 592 was also available as an analyzer with the 593 tube test panel. 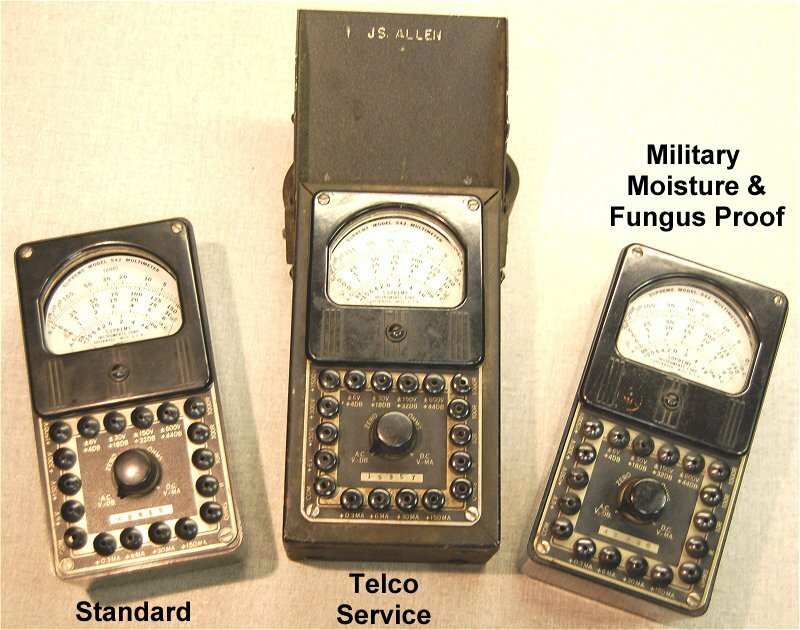 Note: Red buttons on meter at right were painted by previous owner. All buttons on this model were black. 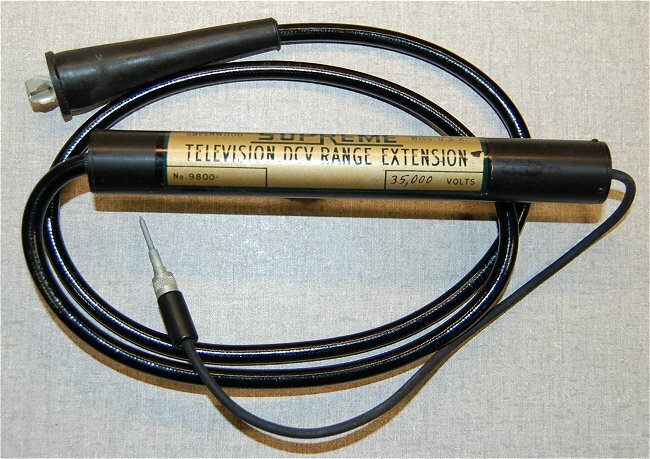 This High Voltage Probe was sold as an option to allow Supreme multimeters to measure DC voltage (cathode or filament of TV rectifier tubes) up to 35,000 volts. This probe was offered as an option for the Supreme models 565, 574, 644, 640, 592, and 562. This meter is the companion to the Military I-177 Tube Tester. 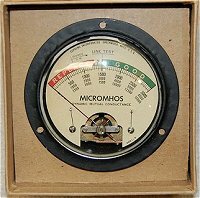 Meter measures:	AC Volts, DC Volts, and ohms. 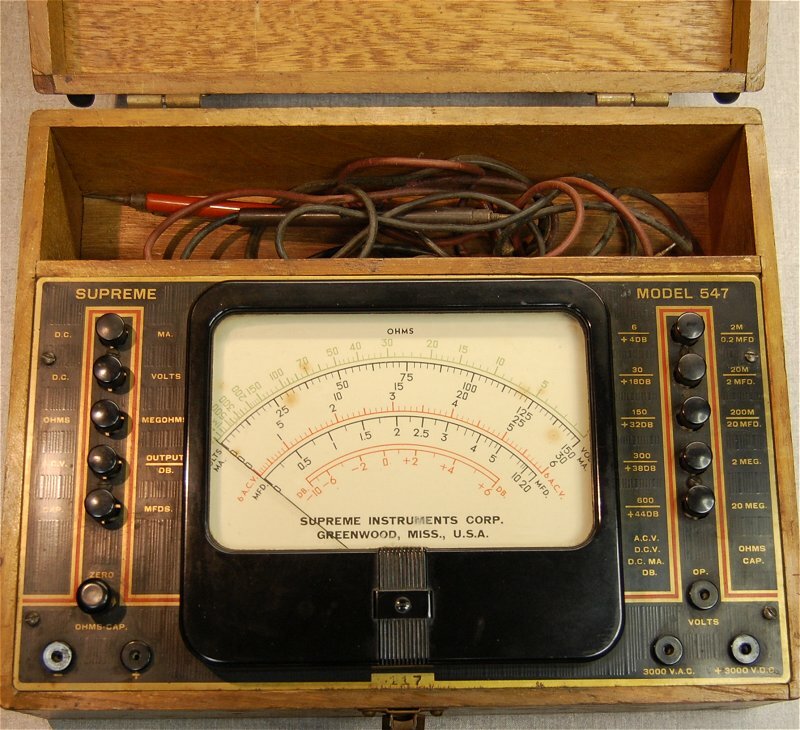 It uses a 4.5V battery for the ohms scale. Unit has a heavy protective coating inside and out to protect it from moisture and to help combat fungus. 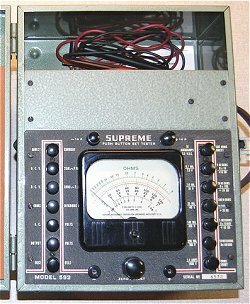 This meter is another Military tester manufactured by Supreme for the war effort. 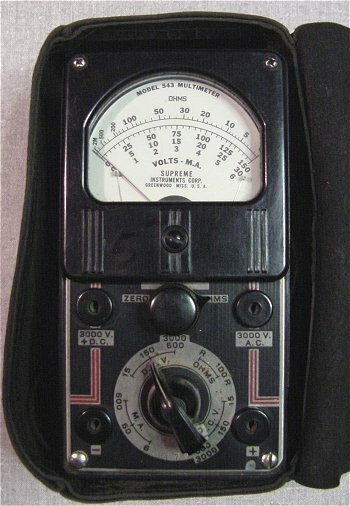 Meter measures:	AC and DC Volts, Ohms, Current, and contains high voltage probes for measurements up to 5,000 volts. 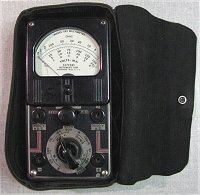 Meter is housed in a heavy steel case. 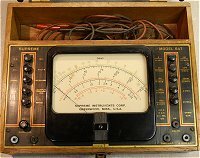 This unit has all the original manuals, probes and the spare rectifier that was issued with the meter for field replacement. 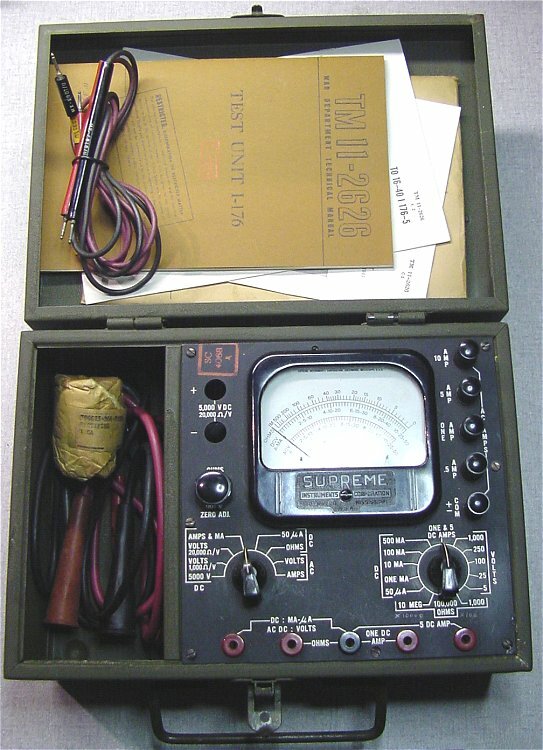 Replacement meter (#3801-X) for the military I-177B tube tester in its original box. 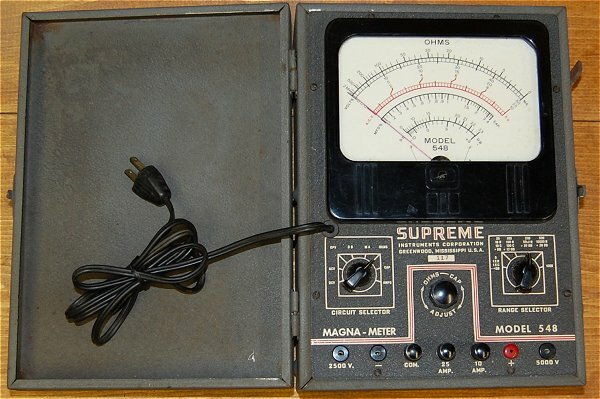 Supreme factories produced thousands of panel meters for industrial applications and the military. 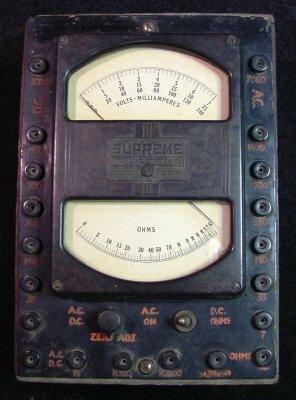 When I first saw this meter and the hand lettering, my first thought was it's a homebrew that someone made from a Supreme dual meter movement and spare parts. When I opened it, I found that the bakelite panel it was made from was actually the back of an unused, undrilled, Supreme faceplate for a model 450 Supreme tube tester. 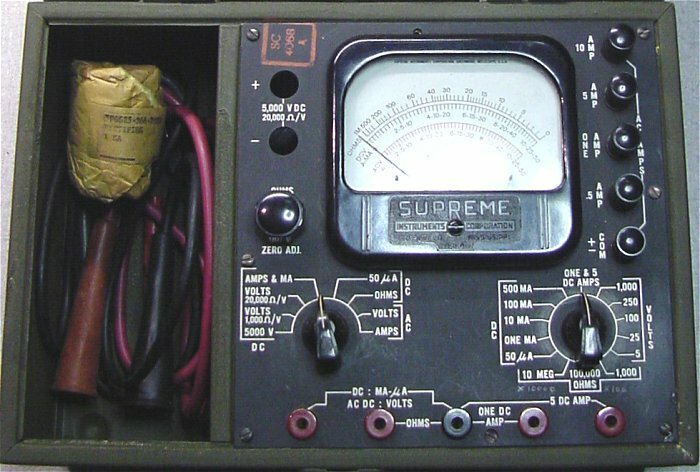 Also, all the holes are precisely spaced and drilled, even the large round hole for the meter and all the parts are the same as parts used in other Supreme models at that time. 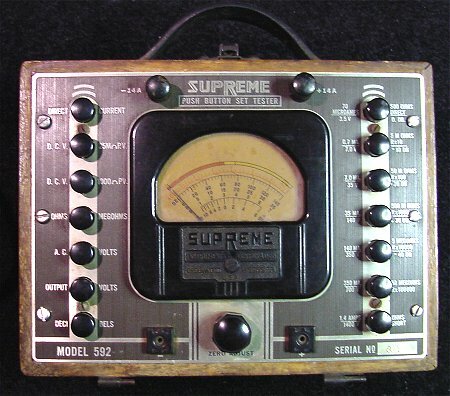 This leads me to believe that this might be a pre-production prototype the engineers at Supreme were using to test one of their meter circuit designs. 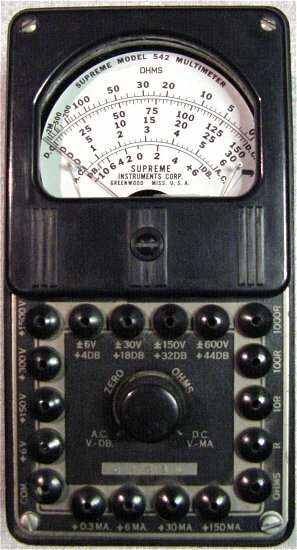 7"x10"x4.5"
View a photo of the back of the faceplate comparing a model 450 tube tester faceplate with the undrilled faceplate used for this meter.